The Torklift Fastgun is a spring-loaded lever-action turnbuckle that gives you the freedom to connect and disconnect your Truck Camper fast and easy. Simply adjust the length one time and then use the lever handles to cinch down to the desired tension. Leveling your camper is made easy by pulling the handles of the Fastguns to unlock and disconnect, and then using the jacks to level. Torklift Fastguns come in 3 colors, Polished Stainless (shown at top), Stainless Grey, and Stainless White. Standard Fastguns have a 25" to 43" reach and are used with front and rear frame mounted tie downs, like Torklift Frame Mounted Tiedowns, or rear bumper mounted tie downs. 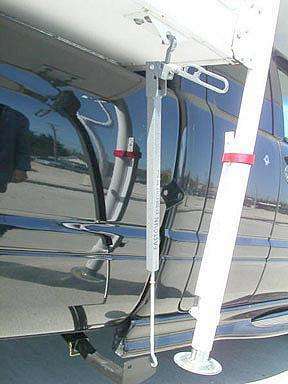 Shorter Fastgun turnbuckles (14.5" to 21.5) are available for bed-mounted tie downs. Protect your Truck Camper from vandalism and theft with Fastgun Locks Sold in a keyed-alike pack of 4, they make a perfect addition to your fastgun investment. Please visit Torklift Camper Tie Downs website for more information and testimonials from satisfied users.